If there’s one genre I loved as a kid, but don’t see much in the YA age range nowadays, it’s the action/adventure story. 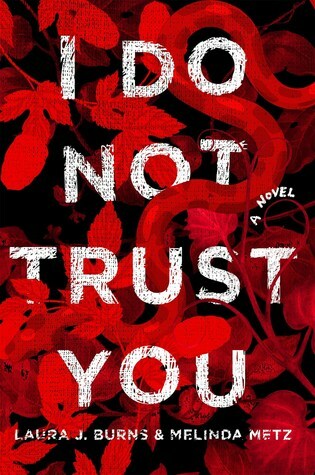 While I Do Not Trust You is being marketed as a mystery novel—and I can see certain aspects of that, too, don’t get me wrong—I think this book would be fantastic for anyone who loved action-packed, suspenseful tales of people being sent on wild missions, full of unexpected obstacles and enemies. It is said that the battle between Set, god of discord and mischief, and Horus, god of kings, will continue until the end of time, when chaos will overrun harmony and the waters will swallow the earth. I knew that the story would involve Memphis—or M, as she goes by—being sucked into a shocking search for lost artifacts to save her father (who she thought was dead—surprise! ), but I didn’t realize just how heavily involved the mythology in this story would be, and that was such a pleasant surprise! I grew up obsessed with ancient, lost myths, especially those of Egypt and the Greco-Roman periods, so that entire theme of this story honestly just made my inner child geek out so happily. It’s been a long time since I studied any of that mythology, so I can’t speak with certainty for how thorough the research was, but it never felt disrespectful or blaringly wrong to me. There’s also a very heavy religious theme in the story, though not in a conversion-geared way; it’s just part of the history they’re researching, and part of Ashwin’s daily life as a follower of Horus. I actually really enjoyed the idea of this modern character being depicted as belonging to an ancient pagan religion, since that is something I don’t think I’ve ever seen in a book set in today’s timeframe. Unfortunately, the downside to this is that, halfway through the book, some fantasy elements come in on the religious side of things, and it made it a lot harder for me to appreciate Ash’s beliefs at face value. I strongly believe that I Do Not Trust You would have benefited greatly from leaving out any of those fantasy elements at all. He wanted to keep going the way they had been, getting along, having fun, building trust. Until he had to betray her. The only other thing that genuinely lacked for me in this story was the blossoming romance, which I was never able to really connect to. This may have been just a personal problem on my part; despite loving M’s character (she is such a clever, tough young woman and I genuinely enjoyed watching her bust everyone’s chops nonstop), I didn’t care much for Ashwin from the start, and never was able to develop any legitimate fondness for him. I didn’t hate him, and he didn’t get on my nerves—he was just sort of there, so it made it incredibly difficult for me to care much about what happened to him or to their friendship/potential relationship. Maybe there’s a spark of the divine anywhere someone worships with pure intent. Minor complaints aside, I Do Not Trust You was a remarkably fun read and I enjoyed it a lot. It flew by, and I kept thinking while reading that it would make a perfect YA adventure film with the right casting choices and a little more humor thrown in. I would definitely check out work from this writing duo again in the future, and can safely recommend this one for anyone who enjoys adventure stories and a bit of mythology. You make a few good points I didn’t really think about tbh. The one about the relationship, for example, it does kind of just happen without any sort of effort from either. Oooh this sounds really interesting, great review! Thank you! It honestly was a really enjoyable story – not one of my faves of the year but def one I’d recommend. I read Sanctuary Bay by this duo and loved it, and was quite disappointed when they didn’t do a sequel. Ever since then I’ve thought about trying more of their stuff- this one might just fit the bill. The mythology angle has me really interested- I love mythology! Seeing a Set vs Horus conflict makes me so curious! I hope you enjoy the rest of it! And yes, it was neat to see that, that’s not something we see super often, especially with a pagan belief sect!